Aromatherapy has been used for literally centuries with wonderful results. In fact, it has only been the past 100 years where people have begun turning to pharmaceuticals and have lost natural remedy knowledge. 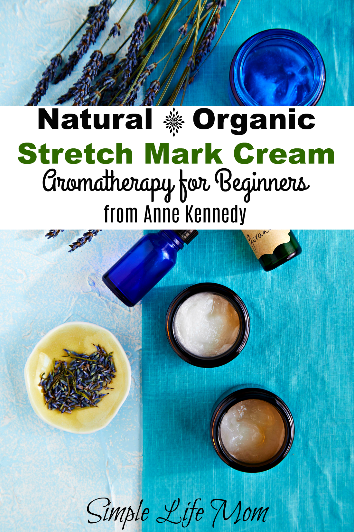 That has been changing lately as people have been fighting to bring back natural traditions combined with modern knowledge of medicine to give you such resources as this Natural Stretch Mark Cream recipe. 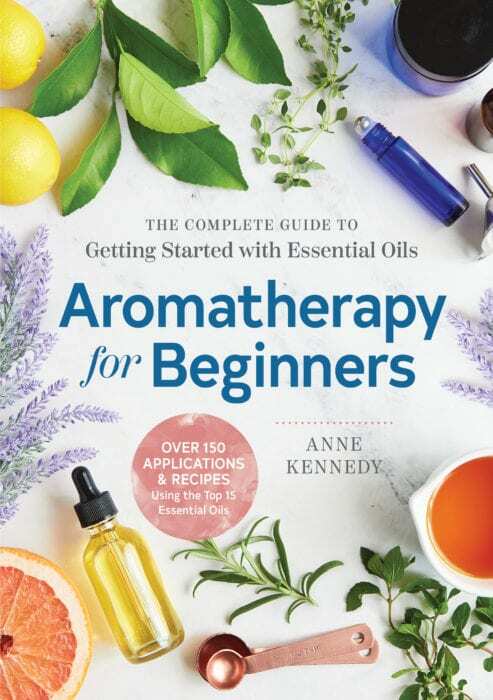 I’m excited to tell you about a great resource today: Aromatherapy for Beginners by Anne Kennedy. Rockridge Press is providing 3 copies of the book for a wonderful giveaway (see below) and is sponsoring me to give you my own opinion about the book. What’s I’ve found out? It’s definitely not just another book on essential oils. The resources and recipes are fantastic! If you are skeptical concerning essential oils and herbal use for medicinal purposes, understand that you already use herbs for health by incorporating ginger, garlic, basil, oregano and other foods into your daily meals. Essential oils are simply a more concentrated version of these herbs. No wonder some essential oils are more expensive than others. If that plant only produces a small amount of essential oil, it can take many pounds of the plant to make a tiny bottle of essential oil. The potency of essential oils should not be overlooked. In Aromatherapy for Beginners, Anne does a great job discussing the safety precautions that should be taken with essential oils and why. She explains how it is not only more beneficial to your body to follow her safety guidelines (and touches on the fact that people are becoming sensitive to oils after prolonged use without dilution), but also how it is more frugal. Essential oil companies are very controversial these days. There have been a few, like Starwest Botanicals, that have been around longer than anyone else. And there are a few others, like Young Living and DoTerra, who set themselves up as arch rivals and have aggressive marketing techniques stating that each is the ONLY company to use if you want top notch pure oils. Then you have those mysterious ones that have popped up on Amazon that sell oils extremely cheap, yet for some reason the oils just don’t smell as potent or quite right. What’s a person to do? How can you decide what’s best when there are no outside regulatory groups or standards? Anne gives you a list of those who have been around a while, what to avoid, and warning signs in order to help you make the best decision. Anne Kennedy’s recommendation for tools come in “Essential Tools”, as well as “Nice to Have” extra options. I love that she helps the beginner know which tools are needed and which tools are just nice extras so that you can stick to your budget. troubleshooting Q&A for those with sensitive skin, children, elderly, etc. bruises, acne, pms, sleeplessness, burns, itchy skin, swelling, sunburns, tooth aches, anxiety, as well as skin and hair care! Here is just one of the 150+ recipes that I found in Anne’s book. She gave me permission to share the natural stretch cream recipe and hopes that you enjoy it and check out her book: Aromatherapy for Beginners. Topical, Safe for Ages 12+ This cream promotes healing, and it can reduce the appearance of stretch marks. The cocoa butter, coconut oil, and jojoba oil provide deep moisture. Don't be surprised if you find yourself applying this lovely moisturizer even to unaffected areas. In a small bottle, combine the geranium, lavender, patchouli, and roman chamomile essential oils. Let them rest overnight. In a double boiler over medium-low heat, combine the cocoa butter and coconut oil. Stir until the ingredients are just melted. Add the jojoba oil and the blended essential oils. Transfer the liquefied blend to a small bowl and refrigerate for 2 hours. With a handheld mixer, whip the solidified cream until it has a light, silky texture. Transfer the balm to a bowl with a tight-fitting lid. Use your fingertips to apply ½ teaspoon of the cream to each effected area and repeat at least twice daily. Store the cream in a cool, dark place between uses. Tip: You can use mango or shea butter instead of the cocoa butter, or leave out the jojoba oil and cocoa butter in favor of a simpler balm made with 1 cup coconut oil. Thanks to Rockridge Press, we are giving away 3 Copies of the book Aromatherapy for Beginners by Anne Kennedy! This giveaway is for those within the United States. For those of you who are not within that range or want to go ahead and buy the book now, Amazon has the book on sale if you would like to go ahead and Pre-order. Enjoy! The book sounds very informative! It really is. Lots of great recipes. I do use some aromatherapy, but I will admit I am cautious as I don’t really know what amounts to use. Well, this is a great resource then. You can also check out essential oil safety on my website and different recipes here. this recipe sounds absolutely amazing! I could really use something for the stretch marks on my hips. Absolute life saver! This sounds like a resource to go back to again and again. Would be thrilled to own a copy! Thank you so much for the review. Thanks for checking it out Cheryl. 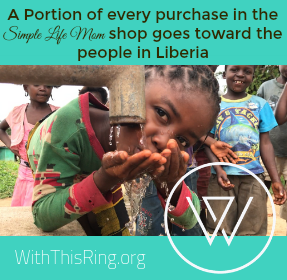 information and the opportunity to be in a giveaway drawing. You’re welcome. I’m glad I could spread the news. I do currently use some essential oils and I am thinking about getting a kit from Young Living to expand my collection. This would be a great book to own and I am crossing my fingers! I do think that essential oils have great potential to help with health issues. Oils have changed my life. My skin has never been so healthy since I started using them in my skin care regimen. Definitely looking forward to trying this recipe. I got a little aromatherapy set for Christmas so I just started using it. I do use aromatherapy in my home, but am just getting into it and would really like to learn more, esp. the cautions, etc. This book looks great! I have been using a mist diffuser on my nightstand with a few drops of lavender to help me sleep. I really like that you explain your reason for each item you use. I love learning new recipes. 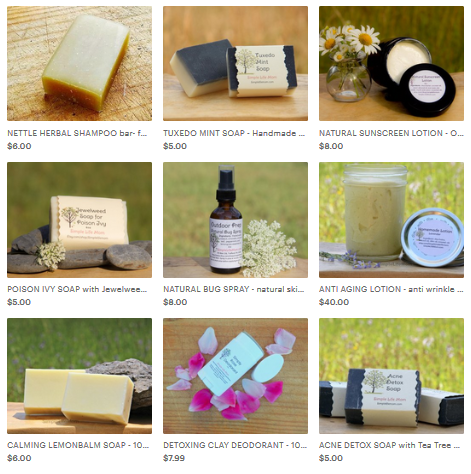 I make everything from cleaners and personal care products used in our home. Thank you for all the information you provide. I do my research. I’ve been learning a lot over the years too, so I’m so glad that I can provide it for all of you. I do currently use essential oils, but I always love learning more about them! Sounds like a great book! Thanks for the chance to win a book! You’re welcome! Glad you entered! I use essential oils and aromatherapy at home for healing, cleaning and because they smell nice without chemicals! 🙂 I finally have more time available to explore the possibilities and it looks like this book would be a great head start! That’s great. I love having those times where I feel I can sit down and delve into something that I’ve been wanting to do. Kelly, I appreciate your email links, recipes, and information so much! Essential Oils are very important in our home, and I like learning all I can from quality sources. Your website is great! I am a beginner when it comes to aromatherapy. I want to learn more though. I have very sensitive skin and asthma so I have to be careful – strong scents make me wheeze! Yes, you definitely have to be careful. If you know of some that don’t give you any problems, you can look for others within that family and only use small amounts instead of larger stronger scents. I use aromatherapy some in my home. I use essential oils and love them! Sounds like this would be a good reference book. I’ve used some essential oils in the past but was always skeptical about the quality and it’s so confusing when you try to get information. This book would be a godsend! I already study herbalism and this would definitely enhance my knowledge. Thank you! I am interested in making soaps and balms using natural ingredients and this book would give me great information about using essential oils. This would make a great addition to my natural library! I am just beginning to use aromatherapy in my home.